An array of three rabbit ears in a bright blue sky: South Rabbit Ear (on left), Middle Rabbit Ear and North Rabbit Ear. The Pine Tree Trail in Aguirre Spring Campground is a loop trail. This trip report describes a counterclockwise, 4 mile trip on a well-maintained tread. The surrounding terrain is dramatic, with the craggy Rabbit Ears perked up into the northern sky, Sugarloaf Mountain grabbing the southern view and the Organ Needles hovering directly overhead. 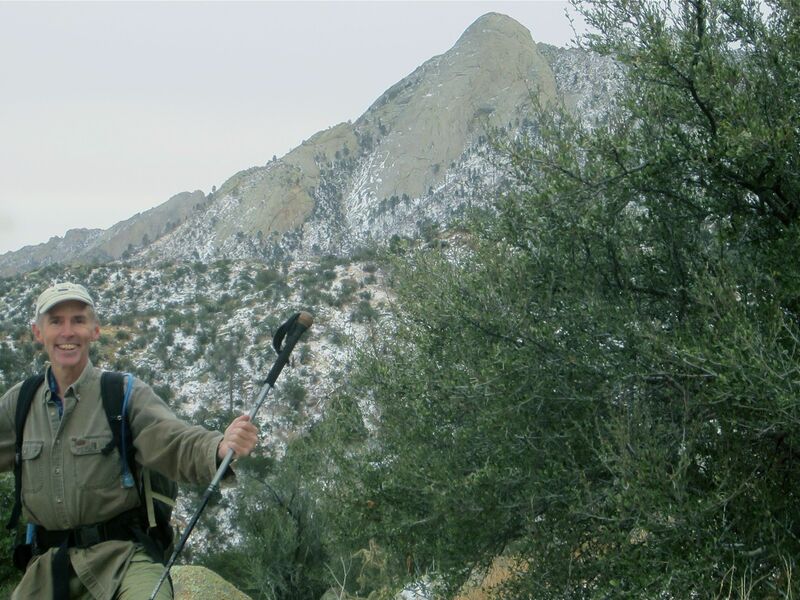 It is not a particularly demanding hike, but it is a great stay-in-shape destination close to Las Cruces. There are fees for using the Campground. Make sure to bring the correct cash amount or a check (see below). In 14.4 miles go right onto Aguirre Springs Road. On this day there was no sign naming the road, but there is a notice on US 70 letting you know that the exit for Aguirre Springs is a quarter mile ahead and at the exit itself there is a large brown sign (Park Service style) saying “Aguirre Springs Campground”. In 5.0 miles stop at the self-service pay station for Aguirre Springs Campground. In an additional 0.1 miles on Aguirre Springs Road (at the top of the next rise) turn left into the trailhead parking. The fee for day use is currently $5.00 per car. For camping the fee is $7.00 per campsite. If you have the Golden Age Passport, the Interagency Senior Pass or the Interagency Pass then the day use fee is only $2.50 (for the pass holder’s car, but not for group use). If you have the Senior Pass then the charge for a campsite is just $3.50. Cash or checks can be used, there is no change service. The Aguirre Springs link above should be up-to-date on any changes. The Aguirre Springs Road is gated about halfway to the Campground. The exit “gate” is a tire-shredder preventing entrance, so you don’t have to worry about getting locked in. Don’t arrive too early or you may have to wait at the gate. Currently the opening time is 8:00, but check the Aguirre Springs link before setting off. Pine Tree trail trailhead, with southern Organ Needles seen in distance. 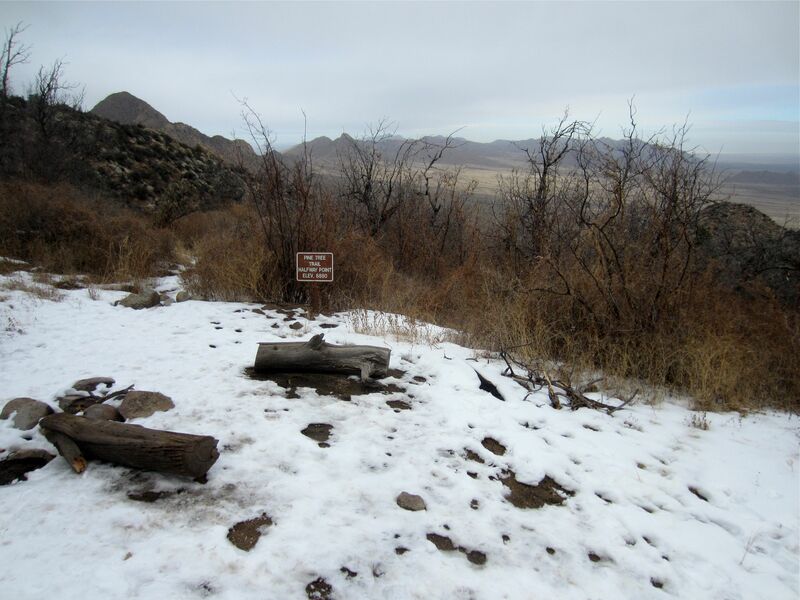 The trailhead is signed, it has a trash receptacle, views of the mountains to the west and the Tularosa Basin to the east and a covered picnic area. There is no water at the trailhead. If you need water there is a host site on the Aguirre Springs Road, about four miles before the trailhead. A sign there offers potable water, but it isn’t clear how often the host site is open. Maps: The USGS Organ Peak quadrangle is probably all you have to have, although the Organ quadrangle to the north would be handy for identifying the mountains to the north of the Campground. Words of wisdom from the Bureau of Land Management. (Double-clicking will enlarge any picture). Sign-in at the trailhead. Aguirre Springs Campground is run by the Bureau of Land Management (BLM) and the log helps justify the Campground’s upkeep. Begin ascending past the bright yellow warning sign. After a fifth of a mile you will arrive at the loop (signed) and will have the choice of either a clockwise or counterclockwise trip. I chose to go counterclockwise. 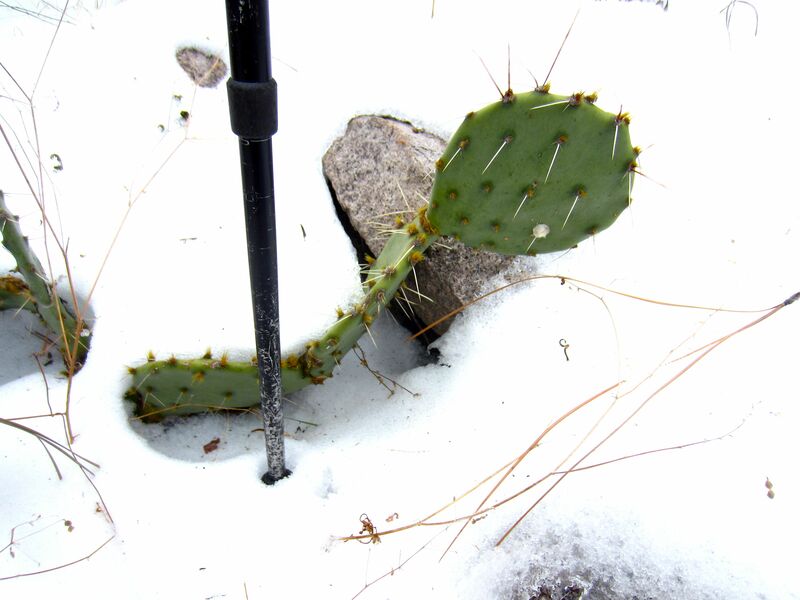 Prickly pear cactus (and trekking pole) in about three inches of day old snow. This portion of the trip follows close to the stream bed for Anvil Creek. 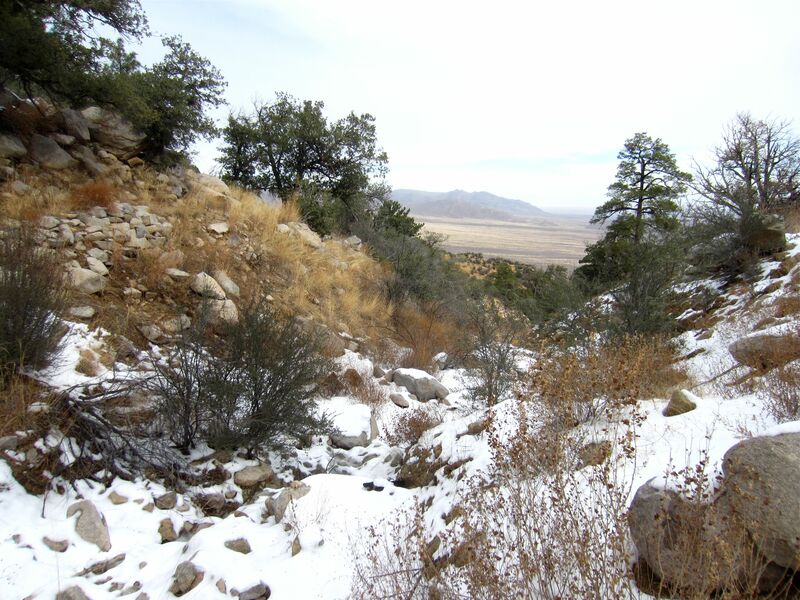 There was day-old snow on the ground and enough had melted that the creek produced that rarest of desert sounds – the burbling of running water. The trail is pinned between the creek bed and a rib descending from the col south of the Rabbit Ears (Windy Gap). With no where to go but up, up you go. At about three-quarters of a mile from the trailhead the trail enters a wide bowl that drains into Anvil Creek. This bowl contains a “pocket forest” that includes the promised pines. Some of these appear to be ponderosa pines since the bark is copper colored, the needles are strikingly long (about six or seven inches) and grow in bunches of three. 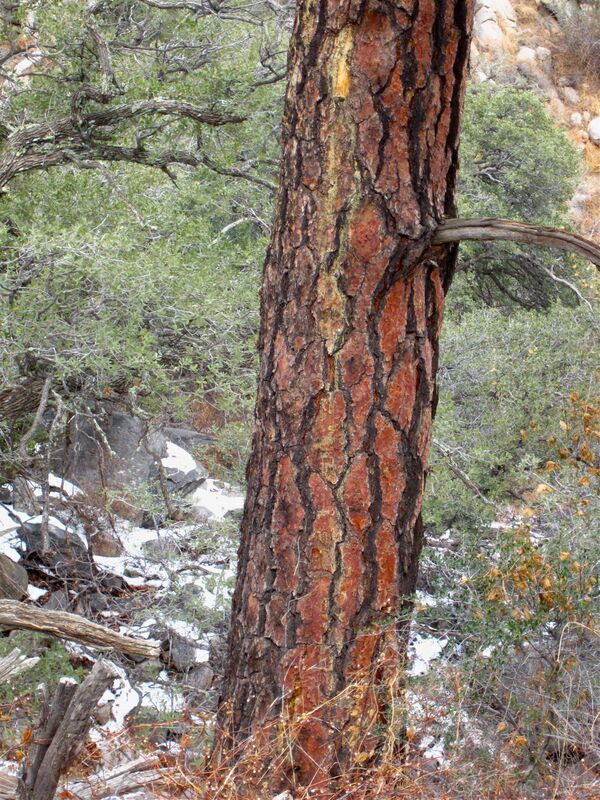 Another pine species with thick, fissured bark and shorter needles was mixed in as well, possibly the Chihuahuan Pine. After rising high the trail makes a sharp left turn (to the south) and begins a traverse the top of Anvil bowl. At this altitude the snow was deeper and packed down in places. I passed a couple people who looked uncomfortable with the footing – one poor soul was trying to manage two dogs that were tugging enthusiastically at the leash. It was slippery enough that the extra traction provided by heavy boots and a hiking pole was much appreciated. After crossing Anvil Bowl the trail reaches a prominent rib at 1.6 miles and curls back, climbing in a short series of switchbacks to begin a traverse of the Sotol bowl. The top of the rib that separates the bowls is open. There are excellent views of the mountains north and south and the Tularosa Basin to the east if you scramble up onto the rib-top. It isn’t clear if the Sotol Creek is named after the drink or the plant). It contains several running streams and where the trail crossed the stream beds the intersection was often flooded and icy. The halfway point is signed, elevation 6880 feet, about midway across the bowl. There are one or two primitive campsites nearby. View of Sugarloaf Peak from descent. The day certainly got cloudy. The trail rises towards the next rib (one descending from SquareTop Peak), as if it intended to keep heading south into Indian Hollow. Instead, at 2.2 miles, near the rib top, it turns east and starts descending. Switchbacking occasionally, the trail rapidly reaches a col between the main slope and an outlying hill at 3.1 miles. At about this point the snow petered out and the footing returned to normal. At 3.9 miles, return to where you entered the loop. Turn right onto the entrance trail and return to the trailhead. South facing banks, such as the one on the left, become clear of snow faster than the creek bottom or the north facing banks. On the high traverse the snow was heavy enough to get packed down and slippery. Some form of traction, like Yak Traks or Microspikes, might be useful. Admittedly, I did not see anyone using them. When light snow has fallen, like today, it may be best to hike the loop counter-clockwise. In either direction you have to traverse the high terrain, descending into stream beds and then climbing up the far bank. If you go counterclockwise you’ll be making the tricky descents on banks with southern exposures, are are more likely to be free of snow. Some folks seemed to be hiking in tennis shoes and t-shirts. Granted, of course, that the trail is very well maintained and only four miles long. Still, it is easy to imagine midwinter circumstances where a heavy jacket and a good hat would be welcome. Author on the rib between the Anvil and Sotol bowls, with Sugarloaf in the background. Hiking in cool and overcast conditions is wonderful. Where the trail wound through snowy evergreens I was reminded of the Cascades. I took along a 2 liter water bag and a liter bottle, and didn’t drink any of it. 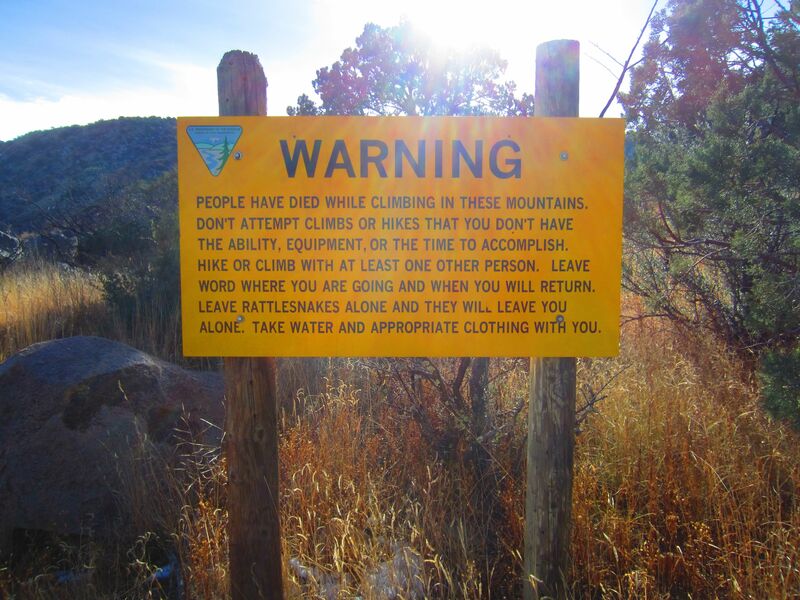 That is not typical of Organ Mountain hiking! 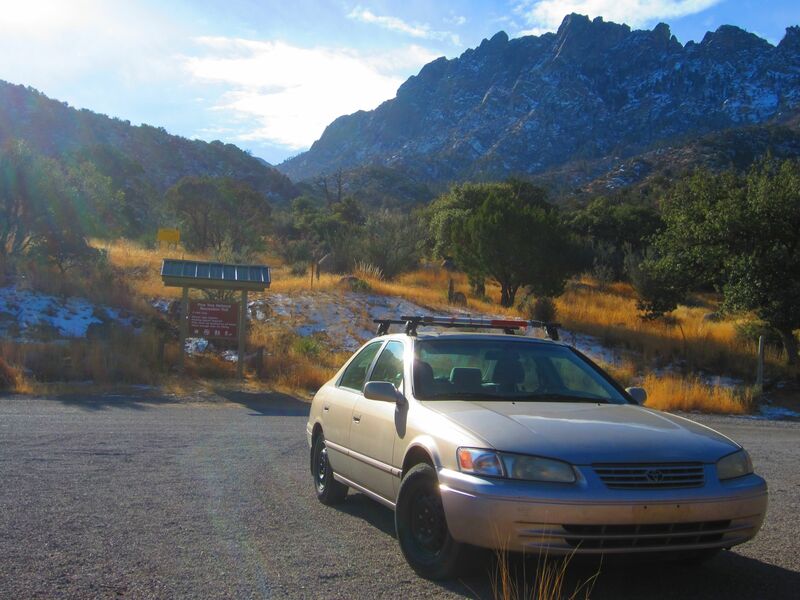 The SummitPost site (2007) reports that the ride along Aguirre Springs Road is 6 miles rather than the 5 miles reported here. That is backed up in the guidebook “Day Hikes and Nature Walks in the Las Cruces-El Paso Area” (2004). I’m not certain who is correct. The reviews on TripAdvisor are mostly very positive and the photos will give you a better idea of the park in warmer seasons. OnWalkabout has an interesting post about the possible ascent into Windy Gap using Pine Tree as an approach trail. The author did not make it to the ridge top, but it sounds intriguing. 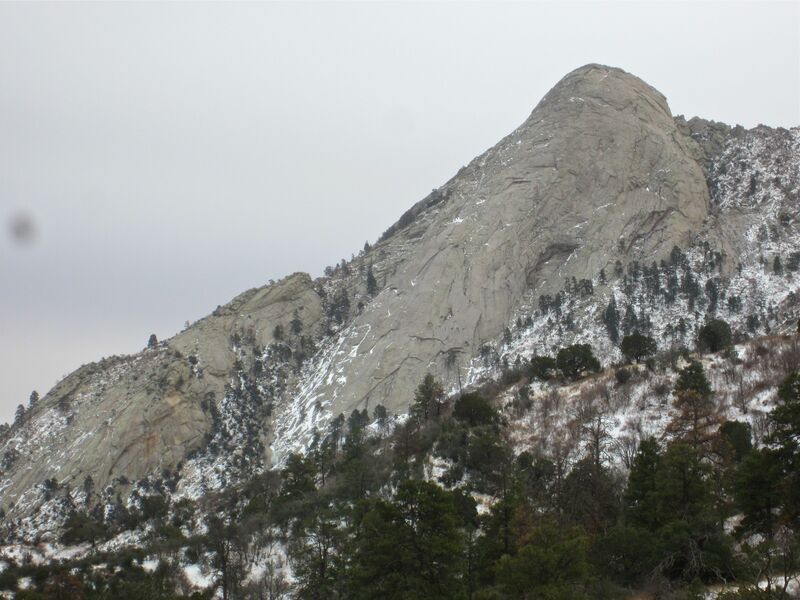 If a four mile hike seems too short, then the folks at the DailyMile running site suggest running across the mountains via Baylor Pass and then adding on Pine Tree trail. That would make for a 15.5 mile day out in the mountains. 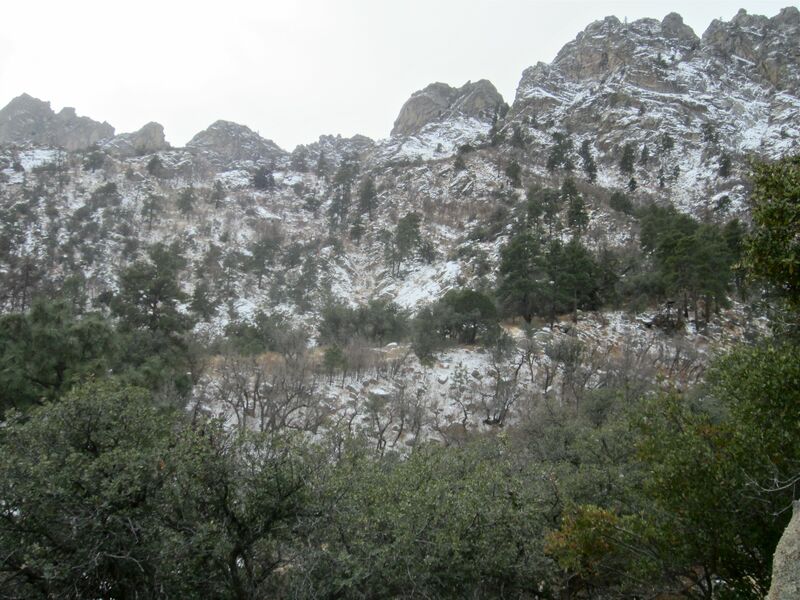 SouthernNewMexicoExplorer offers some great dry-season photos from the trail. 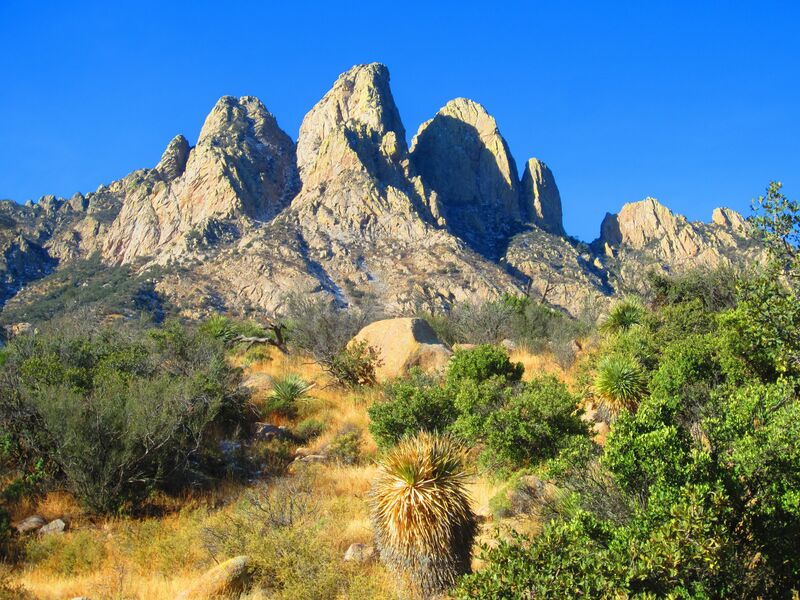 In his text he mentions several alternative destinations in the Organ Mountains that sound intriguing. He mentions a prohibition against pets at Aguirre Springs, but note that the Bureau of Land Management now says that leashed pets are allowed on the trails. This has become one of my favorite weekly hikes. Short drive from El Paso & the shade it provides (compared to Dog Canyon) is wonderful. The scenery is breathtaking, (especially if you remember to look over your shoulder while heading back) & unexpected in a desert. This time of year it is pretty reasonable to approach the crest from the western side. Folks in El Paso may want to give the approach to Organ Peak a go. That trail has a surprising amount of tree cover, “the narrows” are a hoot, and the open terrain at the top invites you in for all kinds of exploring.